There are chocolate martinis and there is a Godiva chocolate martini!!!. True chocolate martini experience is incomplete without Godiva original liqueur in it. 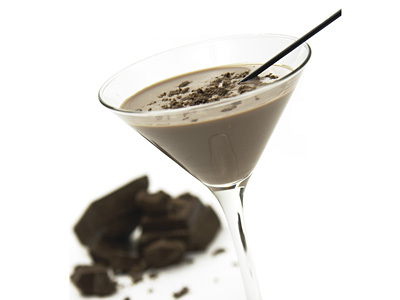 Try this heavenly blissful martini prepared with Godiva liqueur and indulge in true chocolate experience. Add vodka, liqueur and half and half in cocktail shaker filled with ice. Tumble cocktail shaker for 25-30 seconds. 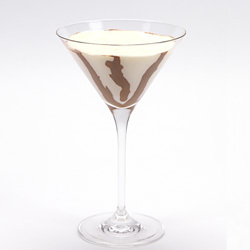 Take chilled martini glass, pour chocolate syrup on inner rim and spread it randomly. Strain and pour chilled drink into garnished glass and serve. Garnish it with grated chocolate for an irresistible and appetizing looks. Use Godiva caramel milk chocolate liqueur for creamier, smoother, and lighter indulgence. Experiment with your creamy martini! sprinkle few choco chips over it for an unforgettable experience. Serving Ideas: It is a premium chocolaty cocktail dessert perfect for Holidays, Christmas, Thanksgiving and New Year parties.